Back in 2013 three friends, Steven Ford, Bruno Aschidamini, and Brandon Leibel were selling life insurance from a call center in San Diego. Not content with their post grad corporate gigs they decided to risk it all and start a beach towel company called Sand Cloud. In 2017 San Cloud is on pace to do $7 million in sales. Here is how patience, perseverance, and failure propelled them to the top. Living in Southern California gave the guys an idea for a business: a towel that would help people take better naps on the beach. So the friends ordered a few dozen beach towels and travel pillows from a discount website and had a local seamstress sew the pillows to the towels. They called the company in the early stages Cloud Nine. A couple weeks later they were selling their Cloud Nine beach towel pillows to family and other friends, but they were barely breaking even. The trio lacked the discipline and ultimately the know-how on how to correctly build a solid brand. After several frustrating months, they gave up on building their business and decided to do their separate things. Fast forward to April 2014 during a game of catch on the beach, Aschidamini brought up Cloud Nine. Leibel didn’t want to talk about the failure — until Aschidamini said he had a better name for the product: Sand Cloud. Inspired anew, the three friends created a business plan that night. Committed to building Sand Cloud, the friends started the second round by getting ultra frugal. They moved in together into a two bedroom and for food they made rice and beans and they signed up to be Uber drivers to bring in extra money. To buy their first shipment of towels, the co-founders raised $5,000 each from their families and maxed out several credit cards. That summer, Sound Cloud had burned through almost $30,000 and had virtually no sales to show for it. In January 2015, Sand Cloud went to the Surf Expo trade show in Florida to try and sell the pillow-towel to retailers. But instead, everyone kept asking about a towel decorated with a mandala they had tucked away in the corner of their booth. The three co-founders had ordered the mandala towel from their manufacturer as a sample but hadn’t attached a pillow. 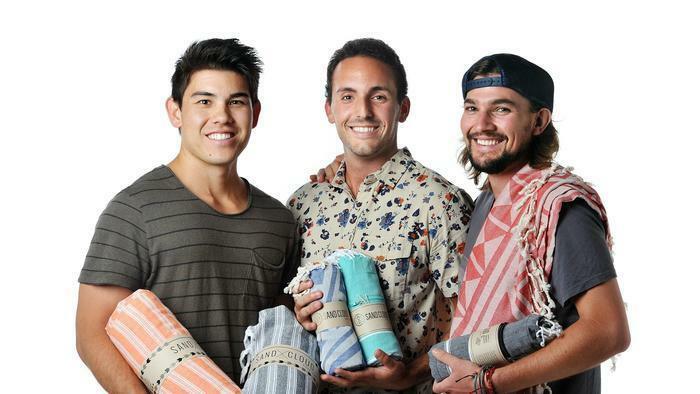 A buyer from the surf and snowboard brand Quicksilver placed an order for $20,000 worth of the pillow-free mandala towels. With such a large order, the Sand Cloud team decided they should add it to their regular offering online. Over the next year, sales of decorated beach towels surged, while sales of the pillow-towels driveled into insignificance. In 2015, thanks to the addition of the pillow-less beach towels (which sell for between $44 and $99 each), Sand Cloud did $430,000 in sales. The guys finally stopped driving for Uber at the end of that year so all three could focus 100 percent on the business. The three co-founders shipped the first half million dollars worth of inventory out of their two-bedroom apartment before they moved to an office. Sand Cloud’s momentum accelerated at an impressive and steady rate. They added accessories, water bottles and jewelry to its product line-up. In 2016 the company did $2.4 million in sales and 2017 projections are hinting towards $7 million. Looking back to where they started, the co-founders say they didn’t know how hard the path would be when they first had the idea for the pillow-towel. “We were so inexperienced at the time, we thought we are just going to put up a website and become millionaires. The blind faith that we had to pursue freedom and become an entrepreneur — we never questioned it once.” – Brandon Leibel. Now, after celebrating its two-year anniversary, Sand Cloud is still expanding, growing and making a difference. Although the team is still small and concentrated, Leibel, Ford and Aschidamini have their own office, complete with interns, independent contractors and people to help with delivery. It was a harder journey than they expected, but they were were unshakeable in their determination.